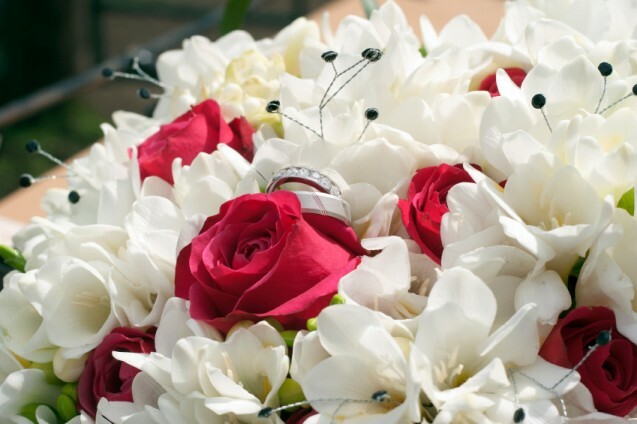 White flowers are a traditional floral choice for a wedding. From bridal bouquets, centerpieces, arches to other floral creations, this symbol of purity and innocence remains a favorite. Many brides opt for classic white roses and baby's breath framed with greenery for a romantic wedding bouquet. These selections can be used for table centerpieces and various flower arrangements. White wedding flowers are a popular addition to the church altar during the wedding ceremony. White arrangements will always work in churches, while colored blooms may clash with the overall atmosphere due to elaborate interior decorations. Large potted floral arrangements can also be moved to the reception location after the ceremony concludes. Tulips are a great choice for spring wedding bouquets, and white tulips are chic and elegant. The blooms can be clustered in a classic hand-tied bouquet, or larger stems can be used for tulip cascades or arm bouquets. Lily of the valley is a delicate, sweet option for spring and early summer wedding flowers, and the bell shape of each bloom is reminiscent of wedding bells for even more symbolism. Clusters of these tiny flowers can create delicate centerpieces, or individual stems can be added to larger floral arrangements or bouquets. White flowers are frequently used for the groom's boutonniere. One large or medium bloom may be used, or several smaller blooms can be clustered together. A touch of green or accents in the other wedding colors are popular to add to boutonnieres, and pearl pins give the flowers an elegant touch. All lilies are popular white flowers for weddings, but calla lilies are especially trendy because of their chic, smooth texture and variable sizes. A thick cluster of white callas is perfect for a modern bride and an elegant celebration. Basic white blooms such as hydrangea, roses, carnations, and daisies are perfect for large floral arrangements because they can serve as filler so the flowers are less expensive. All white arrangements are especially suitable for reception halls with richly colored walls and table decorations, since they will not clash with other colors and will not overwhelm guests with a rainbow. Couples who rent a black limousine or antique car for their wedding may want to consider white flowers to adorn the car for their getaway. The white blooms add a classic touch and stand out against the car without seeming out of place for a wedding celebration. White plumeria blooms are the perfect option for beach wedding flowers or to add a tropical touch to any couple's celebration. White flowers are especially popular when the colors of the sand, sea, and palms will be bold and luxurious, making the simplicity of the white flowers stand out even more. Simple white daisies are an innocent and sweet choice for a casual garden wedding or country theme. A handful of blooms in a tin pail, terra cotta pot, or wicker basket makes an instant centerpiece that is beautiful without being fussy. Roses are always the most popular wedding flower, and an arrangement of white blooms can be a perfect low centerpiece for wedding reception tables. To add more distinction to the table decorations, scatter rose petals, buds, or cut blooms at each place setting. This can also make the centerpiece seem larger for couples who don't have a large floral budget. Real or faux, white flowers on a white wedding cake are elegant treats. Many florists will be happy to provide extra white blooms to adorn the cake, or couples can speak with their baker about crafting an edible white floral arrangement to serve as the cake topper or as a spray down the tiers of the cake. Many brides opt for floral hair accessories, and white flowers are a beautiful option that coordinates with the white of the wedding dress. A few simple blooms can be used to pin back the sides of the hair, or white flowers can be pinned into an elegant wedding updo.